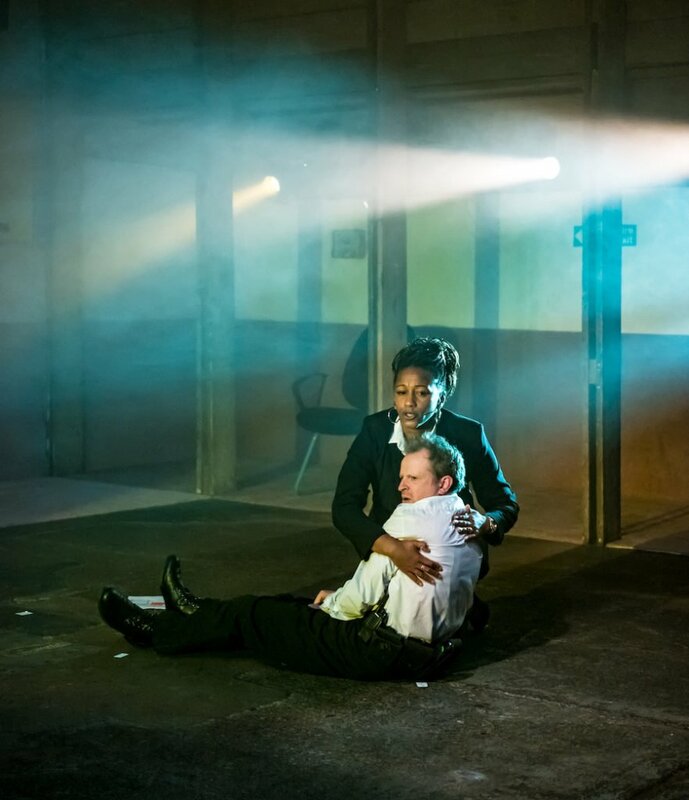 The Yard, a small, hip space in Hackney Wick, has fostered a reputation for innovative and bold programming, with an emphasis on exploring social taboos that other theatres don’t dare to touch. Removal Men attempts to illuminate the murky world of immigration removal centres, such as Yarlswood, where women and children facing deportation are held by the U.K government, with a story about three detention officers who’ve recently undergone training in ‘compassion’. The aim of this training was to enable them to offer a more sympathetic level of care to the women detainees, but the main outcome seems to be a greater pressure on the three to willingly offer and accept hugs from each other. This is a valiant attempt to expose the perversity of our immigration system, using song and dance to challenge our expectations. Social realism is a more familiar form for political theatre, and the decision to instead make the piece an indie musical feels genuinely subversive. 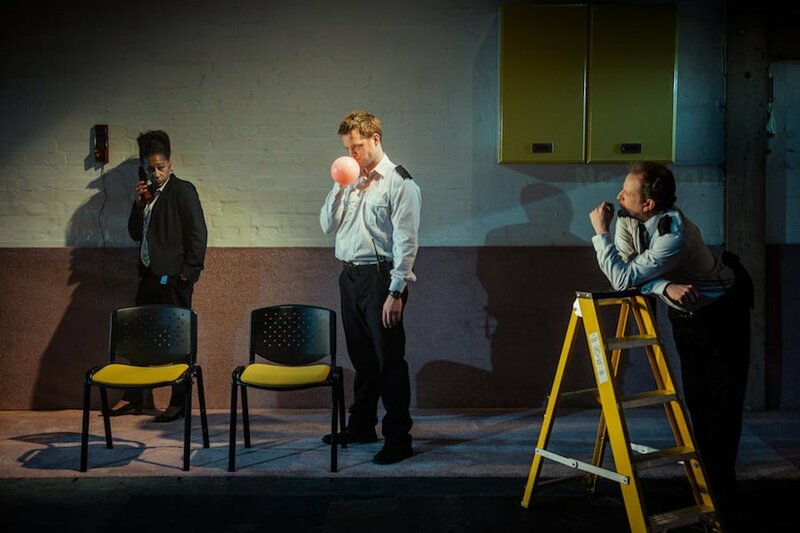 However, Removal Men has an inherent tension between its clearly good intentions and the actual impact of the play. We see the world solely through the eyes of the detention officers, while the female detainees in their care remain off stage, invisible, unheard. This could be seen as an attempt to draw a parallel with the place of failed asylum seekers in British society, but their absence creates a narrative void, where all of the terror, insecurity and jeopardy of the piece remains unexplored. The deceptively simple soundtrack proves to be quite haunting (the refrain from one song ‘but not my skin’ still lingers), and its no surprise to learn that the writer, M.J Harding was a founding member of shambling but melodic indie outfit Fat White Family. The fine cast—Barnaby Power, Clare Perkins and Mark Field—convey a blankness and deadpan attitude to their work and their lives that hints at deep-seated coping mechanisms at play. The dysfunctional nature of this work is reflected in the relationships between the three characters, which is weirdly sexualized at times, nowhere more so than with the detainees themselves. And this is where Removal Men becomes genuinely troubling, albeit possibly not in the way the creators intended. The abuse of power between the officers and detainees goes unquestioned within the piece, to the extent that we’re asked to sympathise with an officer who’s had a sexual relationship with one woman, Didi, who has now fallen pregnant. Instead of exploring the complexities of this relationship, we are led to view him as a victim and object of pity, even as Didi, the woman he purports to love, is forceably deported. Ultimately, despite it’s good intentions and stylistic innovation and flair, Removal Men fails to offer a real insight into what it’s like to work at a centre like Yarlswood, and in turn adds little to our understanding of U.K immigration policy or its impact upon the desperate and vulnerable people who’ve tried, and failed, to seek a new home here. Removal Men is at The Yard theatre until 10th December. Social realism is a more familiar form for political theatre, and the decision to instead make the piece an indie musical feels genuinely subversive.